How do I use voicemail/menu systems correctly with my Gigaset? 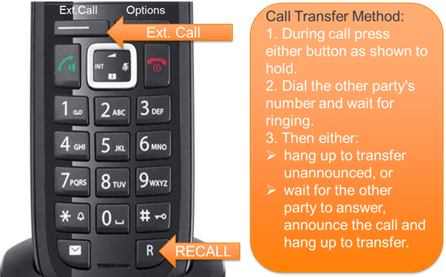 Gigaset DECT phones support two methods of transferring calls, and 'internal' method and an 'external' method. Gradwell recommend that you always use the 'external' method as outlined in this article. Using the 'internal' method will work, but doesn't notify our system that you have moved the call to another phone, which can lead to problems if you attempt to transfer the call again. To successfully transfer a call to another extension, either press the R key or Ext Call soft key to place the call on hold. Enter the telephone number of the person you wish to transfer the call to and wait for it to start ringing. The call transfer will now be initiated. If you wish to perform a blind transfer (i.e. you don't tell the person you are transferring the call to who is on the line) then simply hang up at this point. If you wish to perform an attended transfer (i.e. where you tell the person who is on the line and check that they want to take the call) then wait for the other person to answer. If they wish to take the call simply hang up, however if they don't wish to take the call click the End active call option which will be displayed on the phone. The caller will be connected to you once again.